Profile’s Community Profile program identifies a specific portion of our Portland community that we think will be particularly impacted by our featured writer. We then assemble a cohort of participants to engage in a full year of community-building and artistic practice together. To learn about our 2017 Community Profile program Our City’s Veterans, click here. Come write with us at Profile! For our 2018-19 season, we are featuring two master writers in conversation with one another – Lisa Kron and Anna Deavere Smith. At the heart of the work of both are questions about illness and wellness, health and caretaking and our system of healthcare. For our 2018-19 Community Profile, we are eager to invite those living with these issues every day – patients, family members and professionals – into Profile to reflect, write and share their stories. – The program began in early 2018 with an in-depth weekend of writing instruction lead by mentors from the Writers Guild Initiative. We gathered together the weekend of February 3rd for a writing workshop and attended the production of Lisa Kron’s 2.5 Minute Ride, as well as meeting with our community of artists at the theatre. 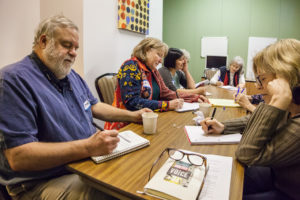 – Throughout the year, we continue to use local mentors for a few hours of writing instruction one Saturday a month – an opportunity to check in, continue sharing pages and deepening our sense of community. – At the end of our 2018-2019 season, there will be another extended weekend of writing workshop, along with a public presentation of writing that has come out of our year-long program. – Profile has commissioned world-renowned theatre artist and National Medal of Arts awardee Ping Chong + Company to create an original docu-theater piece that interweaves the personal stories of six of our Community Profile participants with the history of health care in our city and in our country. Titled (Un)Conditional this original piece will premiere at Profile Theatre in February of 2019. If you or someone you know would enjoy and benefit from participating in this exciting program, please contact Josh Hecht, Artistic Director at Profile Theatre at josh@profiletheatre.org or at 503-242-0080.